rodgersantiques.co.uk » rodgersantiques – open for business ! Home > General Discussion	> rodgersantiques – open for business ! A lighthearted look at the toys, games and the companies that were common place when I was just a young whippersnapper running around in short trousers ! The doors are open to my first ever blog – I hope you enjoy your visit and trust you will come back again. 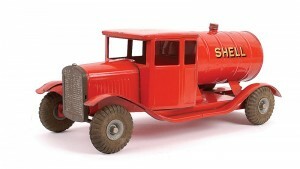 I intend to fill this site with articles about antiques in general but with an emphasis on my main area of interest which is in old toys and games. Unfortunately I am at that age now where the old toys and games of today were actually new for me when I was a lad ! I can still remember when Christmas didn’t begin until December and my brother and I would be sat on a Sunday night at supper time asking mum and dad to let us look through the ‘catalogue’ yet again in an attempt to decide what present we each wanted Santa to bring us. In those days we could each pick just one main toy for Christmas, the rest of our presents consisted of oranges and nuts and either a tin of toffees (Bluebird) or, in my case, a (Barratts) liquorice ‘smokers outfit’ ! 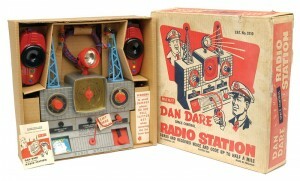 And the main present .. well I can remember my Dan Dare Radio Station .. and a bright red three wheeled bike (my brother later cut my front brakes, actually they were the only brakes, and sent me flying off our back yard steps. Not a big drop, 4 feet or so, but at the time it seemed like the Grand Canyon ….. I can still here myself screaming on the way down ! I feel at this point that I have to qualify the phrase ‘old toys and games’ by admitting that I tend not to go in for the Barbies and Sindys of this world. Its not that I don’t like girls toys – I quite like a good dolls house and a well loved teddy bear still makes me smile – its just dolls do nothing for me. Yes I know we boys had Action Man and G.I. Joe and the like but I’m sorry, whether its a doll dressed in girls clothes or a soldiers jungle outfit, its still a doll ! So bring on the Dinky and Corgi Toys, the Meccano and Bayko Building Sets, Hornby and Tri-ang Toys and other much loved names of days gone and lets play !! Your comments will be welcomed on anything within the site or anything you would like me to consider for inclusion in the future.